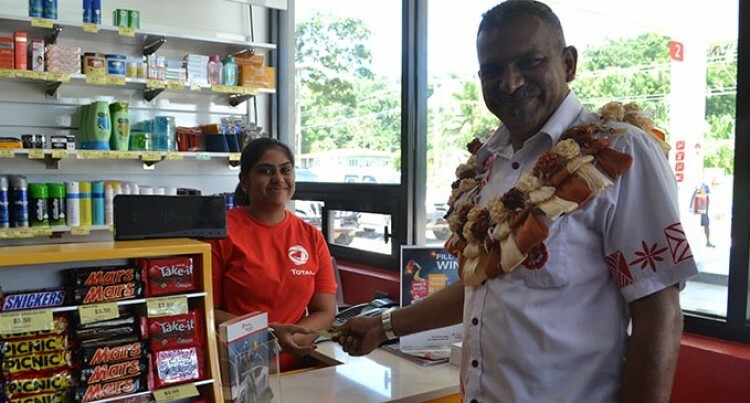 Minister for Industry, Trade,Tourism, Lands and Mineral Resources Faiyaz Koya was the first customer to buy at the Total Service Station in Savusavu after the opening on Friday. Photo: SHRATIKA NAIDU. Minister Faiyaz Koya says the opening of the new Total Service Station in Savusavu, was a symbol of the company’s investor confidence in Fiji. The Minister for Industry, Trade, Tourism, Lands and Mineral Resources officially opened the service station on Friday. Total Fiji has invested $1.5 for this service station. This is the 28th Total Service Station in Fiji. The minister also said that fuel was a key component of growth. Total Fiji managing director Martin McCarthy said it took them a couple years to get the service station ready. “Two of our future investments are to open two big sites, one near Malau in Labasa and the other in West where we have some mining customers,” Mr McCarthy said. He also thanked the Government for being supportive in all of the company’s projects. He said: “Built to the highest international and European standards and thanks to all the services it offers, Total Savusavu service station is sure to make a difference. He added like all Total service stations, Total Fiji respects the environment. Meanwhile, through the opening of this service station the dealer, Tradewinds Marine Group director retail John Philip said ten jobs had been created. “Currently, we have 170 employees in Fiji,” Mr Philip said. Landowner, Ratu Ameme Tabucala said he was very happy to finally see the service station opened. “It is closer for the people of Yaroi Village and this investment will bring more business along Savusavu corridor,” Ratu Ameme said. Total (Fiji) Limited is engaged in retail service stations, commercial and bulk fuels marine activities and lubricants. Total Fiji Limited owns six storage facilities in Fiji with the main terminals located at Walu Bay and Rodwell Road in Suva and Vuda Point in Lautoka. Total is a global integrated energy producer. The company leads some of the international oil and gas company and is ranked the world’s second best solar energy operator with Sun Power. Their 96,000 employees are committed to better energy that is safer, cleaner, more efficient, more innovative and accessible to as many people as possible. As a responsible corporate citizen, they focus on ensuring that their operations in more than 130 countries worldwide consistently deliver economic, social and environmental benefits.